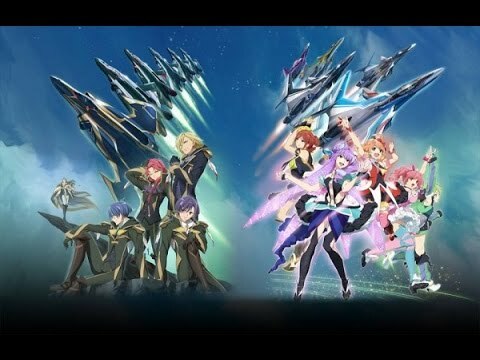 Macross delta ( Macross Δ )is the newest in the Macross series, a mix up of mechs and...J-pop as I understood it. Macross has been running from 1982 and was created by Shoji Kawamori , the series has had over 20 entries consisting of Manga, OVA’s and video games. Delta is being made by Studio Satelight a very impressive studio with shows such as “ Fairy Tail “ and “Hellsing Ultimate” under it’s belt. One of the two directors is the original creator himself Shoji and Kenji Yasuda who has previously done story-boards and direction. Now please bear in mind that I will be commenting on the show as an outsider to the series so I won’t focus on the story too much since it is very specific at who it’s trying to bring in , but rather points that carry over to ever anime. Even after watching 6 episodes I struggled to understand what was going on in the story and there were many elements in play that assumed I’d seen the previous series. The entire premise of the show , if you don’t know is very bizarre with J-Pop idols fighting alongside mechs and tackling a space virus with the power of joy and music meanwhile a grander political space opera plays out.This type of eccentric plot is very dividing and you probably already know whether you want to shut your PC down and never think off Macross again or if you want to rush and start watching immediately. If you are still on the fence however then please read on and I’ll give you my opinion on whenever or not this show is worth getting into. But do keep in mind the insanity and irrationality will only deepen as we progress. “ Right , I will become a pilot but I refuse to listen to authority or let the government have any oversight over my actions” . And everyone just smiles and agrees with him. I doubt the real army would be quite as accepting if I decided to claim a battleship as my own. So while the writing is absurd and you’ll need to bring a rather large suspension of disbelief it’s just trying to have fun and I can’t fault it on that, note I don’t applaud it for it either. I do have a gripe with the pacing though. If nothing in your world is going to be grounded in reality then we as people living in the real world will need some sort of explanation for how the world works or just what anything is. Now I’m not calling for exposition dumps just something to hint at what is going on or how the world functions. There’s a lot of jumping from scene to scene and it feels like a whole lot of action with no investment from us.This isn’t helped by bipolar switching off tone, we open up episode one on a very intense and creepy shot but then having bright dancing mechs in the next. Since half of this show is J-pop , I have no complaints about the soundtrack. While not a die-hard fan of J-pop I was able to get sucked into the action and nod my head along due to the great blending and timing of the fights and the songs. Not to mention the diverse song selection. Choreography is done well and you could take about any clip with a song and dance number and sell it as a feature music video. Despite the brightness of the characters clothing and hairstyles I couldn’t attach or even care about them that much. There’s a lot of two characters based on one trait or trope and that’s all they ever act on with very little development. I’d go as far as to say I disliked the main-character. He’s bitter and cynical despite having no reason to be and it’s done in a way that provides no humour or chemistry. I never believed for a second that anyone cared for each other and for the first two episode there wasn’t even an attempt at making the two key characters act like they had any sort of connection , this is pushed later on but not very well. Dialogue is terrible , no easy way to say it. Now you can just chalk it up to “ just having fun “ but I nothing felt real in this world and in a sci-fi or fantasy setting especially one as out there as this one having just a few things grounded in reality can make the difference whether the viewer feels they could be a part of this world. This goes from questionable military decisions and strange and baseless motivations. The characters are very well animated however. With a wide range of facial expressions and well timed reactions. Faces aren’t that detailed but convey enough to feel a bit deeper.Movements reflect well on their mood and state of mind. The settings aren’t that diverse and feeling very run-off the mill sci-fi. The show doesn’t take any chances with the idea of aliens sticking to basic humanoid creatures. The VAR virus however put chills on my back every time I saw it so good job on that, even if it wasn’t explained all that well. While the colours are bright and pop out at you the lighting is very bare and there’s little in the way of complex shadows. Something that took me a while to place a finger on and it relates to how every fight feels like a music video , but for some inexplicable reason all the shots felt very small and caged in. Now I said this show was half J-pop and half mech action and I praised the J-pop but the action just fell flat on its face. First off something that always makes me grind my teeth , the mechs are made of CGI which not only is extremely lazy since shows in the 80s with little to no budget managed to come up with interesting 2d mechs and the shows own creator has shown his talent at making imaginative mech designs from scratch. But it also throws you out of the scene , not only do the visual styles not blend particularly well but the CG isn’t done very well. It’s disjointed and the textures feel flat and un-tangible. The fights I couldn’t care about due to the poor storytelling but also couldn’t enjoy on a purely visual level ,since all the mechs feel like a plastic action figures being thrown around by a child. Even when a city is being torn down to the ground there was very little weight behind every punch and no grandeur.